Og Mandino’s words echo with me as I ponder our text for today. I wonder if Jacob would have had the self-reflection to speak these words the night he stood by the ford of Jabbok after wrestling all night? I wonder how he framed the feelings that churned inside him as he prepared to face his estranged brother, the brother that he had so much to apologize for; the brother who he feared would meet him with retaliation and violence? Oh Jacob the “grabber,” or the “supplanter” the one who had tried to seize his twin brother Esau and pull him back into the womb as they were being born so that he could be the first-born and all that would offer him. Teen-age Jacob, who having failed at his pre-birth acquisition of inheritance and power, tricks his twin by taking advantage of him as he returned famished at the end of a long day, by offering the immediacy of a meal in exchange for Esau’s claim on the family inheritance. A trade which Esau later responded to with the vow to kill Jacob, which understandably sent Jacob fleeing far away to his Uncle Laban’s home, where he met his wife, Rebecca, and lived and grew his family for many years far away from his brother and from the retribution that seemed inevitable. It is at this moment in time that we pick up the text this morning. Jacob is now returning to his family land and preparing to meet this brother that he had wronged so many years ago. I picture Jacob, sitting surrounded by scrubby grass, on a rocky shore, near the edge of the Jabbok River. He has sent his family across ahead of him, where they are camped safely on the other side. But he hung back, and as the night fell he was left alone on the side of the river. I see him—a thick garment wrapped around his shoulders, his knees pulled up by body, head in his hands, wondering what the next day would bring. Not knowing what the future holds, fearing for his life, the life of his family, and the world he knew. What faced him that night with the dark sky encasing him, as he looked straight into the fear or guilt, shame, and utter vulnerability. The extreme cold this past week has brought vulnerability in front of us. As the polar vortex swept through the country, we know that many struggled, and the already vulnerable become even more so. In this community, many of us were extremely blessed to have warm houses, woodstoves, electric blankets, and heating vents to cuddle up next to. Even with a warm house, there’s a tension and tentativeness I’ve heard expressed by many this week as we’ve navigated the cold. I heard tell of the exhaustion after a normally “easy drive,” taking hours longer on icy roads, the stories of broken pipes and flooded floors, the care for keeping children, aging parents, pets, and ourselves protected from temperatures where any period of exposure would bring frostbite. I have watched, and participated, in the “icy sidewalk shuffle,” as we do everything in our power not to come crashing down onto the ground. We are reminded how we are not in control, we don’t know what is going to happen next—we are vulnerable. Brene Brown, a researcher-storyteller whose TED Talk on Vulnerability captured many addresses this topic head-on. Because she believes, from her extensive research, that vulnerability is a key ingredient in people who are whole-hearted, who experience themselves as worthy, loved, and belonging—people who are alive and awake and whole. The whole-hearted, she says, are the ones who are willing to walk into the vulnerability, to be with the feelings, to have the courage to wrestle in the dark, rather than numbing the feelings when they arise. She offers the idea that we cannot selectively numb emotion. We can’t numb our grief, our shame, our fear, or our vulnerability and still expect to be able to feel joy and delight, purpose, meaning, and happiness. The path to whole-heartedness, to living a authentic life is not to numb the pain and feelings with whatever our favorite coping mechanism is, it’s not to explain them away with a false grasping for certainty, it’s not to turn and go the other way and avoid the struggle. Instead, this is a call to enter into an honest conversation with our vulnerability, to be willing to walk knowingly into the dark and wrestle until daybreak. Can you picture this all-night wrestling match? The physicality of legs and arms, the ebb and flow as one person rises and leans into control, the other trapped, until that twist, and move, and flip, and coming out on top again. The anguish and struggle, the desire to give up and lie, exhausted on the ground, and the determination and strength to keep going. 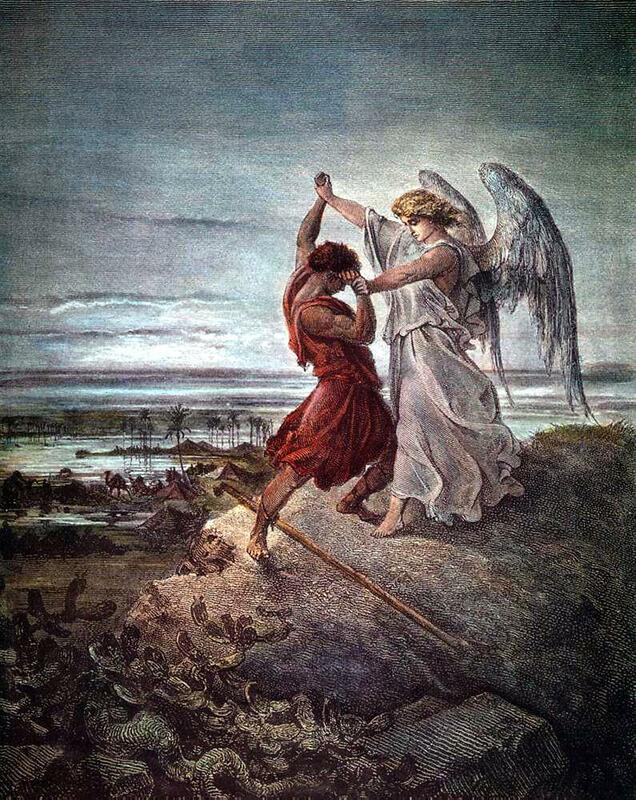 This all-night wrestling partner later referenced as an “angel” by Hosea (12:4), and a “man” according to many Hebrew translators, or a “water demon” according to ancient tradition stuck with Jacob through the night, and Jacob would not let go until he demanded a blessing. Whatever the being Jacob encountered that dark night, he experience that he had, “seen the face of God and lived” (32:20). In this deep night of wrestling, we can imagine that Jacob comes face to face with himself, his God, and his own vulnerabilities. The possible consequences of his past choices are looming in front of him, and he is unsure what is next and whether he will survive it. In all that he brings to the tangled match—all the questions, the fear, the shame—he does not give in. He continues to grapple, to be present with the fight, to feel the feelings, to be in the vulnerability. And, then he demands a blessing. He will not leave this wrestling match until he has found the blessing, and has claimed the conversion that comes out of confronting and working with our deepest vulnerabilities. A number of years ago, I spent an extended period of time dealing with a life threatening and life-altering illness. It was certainly a season that I could compare to this dark night on the Jabbok River bank. It was a time of profound vulnerability, unknowing, and fear of what might be coming next. At some point early on, I remember saying out loud, “If I have to go through this, I damn well better come out stronger, wiser, more loving, and more compassionate on the other side.” The struggle and grappling didn’t magically dissipate; there was no escape from the all- consuming vulnerability of body, mind, and spirit. But there was a determination, an intention, and a reason to keep going through the struggle. And so I wrestled and I demanded a blessing. That journey was too painful and difficult to waste and not come out on the other side transformed. Now I do not believe that God ever gives us struggles or challenges as a test, a punishment, or to teach us a lesson. This is not the God I know. The God I know walks with us through struggles, changes, transformations—a God that accompanies us. Emanuel Swedenborg, an 18th century Christian Mystic of my spiritual heritages writes: “Nothing, not the least thing shall occur that some good cannot come out of it.” I have often found encouragement and challenge in that notion. It’s not that good will necessarily come out of our challenges and hard times, but that it can come out of it. The God of wisdom and transformation is always drawing us towards goodness and love, walking with us through the challenges and struggles. But how we emerge? This depends on how we wrestle, how we engage, and if we demand a blessing. When we can, in the midst of our darkest nights, name a good that God is drawing us to, and put our stake in the ground that we will come out the other side renamed and changed forever. We can demand a blessing when our communities, our families, our churches are going through transition and challenge. Because these seasons of questioning, change, and struggle seem to be an inevitable part of the individual and collective experience of being human, transition, and the vulnerability that comes with it, being an integral part of the life and movement of community. As you—my Richmond Church of the Brethren friends—know so well right now. The process of transformation is not easy, and embracing vulnerability and change—I would posit—is often more difficult in our collected communities than it is in our individual lives. These times when everything is stirred up and we’re offered the opportunities to look at our past, present, and future with new eyes. In so many denominations and churches we find story after story about the change in the church. The way we’ve always done church is not how church is happening. We are walking through the night of wrestling and vulnerability when we see budgets decreasing, upcoming generations not expressing interest in church the way it’s been done, and congregations across the country closing at a rapid rate. It can leave us wondering what is next for us and bring up whatever our individual and collective coping mechanisms and numbing techniques are. We grasp harder at how it’s always been. We go into hyper-gear to raise the funds, find the volunteers, overcome the challenge. Anything we can do to avoid entering into the water, engaging the night of vulnerable wrestling. Until we land exhausted on the riverbank and name the gift of entering the vulnerability, the transformation that can come from the wrestling. When we face ourselves, our present reality, our vulnerability, our collective transformations, it is often uncomfortable. And it often makes for uncomfortable conversations. But, maybe being comfortable is not the point of spiritual life or church or being human. Maybe the church really isn’t about what our needs are and having our needs met. Being the church is about following the movement of God and community. Being the church is about being a gathered embodiment of the two great commandments—loving God and loving the neighbor. The church is about collectively being willing to tussle with what it means to be faithful to God and to our community in this season. The church is about being willing to be together, in the beauty and joy, and in the vulnerability and wrestling. When we face these seasons in life with the demand to become, “stronger, wiser, more loving, and more compassionate” on the other side, we are forever changed. We are not the same person we were before the illness, the loss, the change, the struggle. When we face the changes in our churches, communities, and denominations with the God of change and transformation, the belief in death and rebirth on our lips, then we are not the same churches and communities that we always have been. We are transformed and re-imagined, changed and reborn. And we can imagine, as our it was with Jacob, being re-named as Israel, the one who prevails with God, moving forward in the morning light to meet his brother who would be awaiting him, awaiting him, as it turns out with an embrace, forgiveness and reconciliation. Friends, we stand on the edge of the Jabbok River, looking out towards the unknown that will greet us in the morning. The call is in front of us, to live in the way of Jacob, with the willingness and courage to wrestle all night, to persevere through the vulnerability, to demand a blessing, receiving our new name and identity, and walk forward into the journey forever changed. Knowing that the God who met our ancestors face-to-face, the God of Rachel and Leah and Jacob, the God of Israel, is the God who walks with us into the dark, and the God who shows us the stars. And that we walk forward together with community, naming God’s work with, pointing out to each other the stars that guide us forward into the hope and transformation, sharing the conversations of curiosity, honesty, and reconciliation, and celebrating together the strength, creativity, and vitality that comes after the night of wrestling, with the morning dawn. Where do you see this community in this story? What resonates in you with Jacob’s night of wrestling? What blessing will you demand? May we walk forward into the dark of the starry night, to wrestle, demand a blessing, to be changed and renamed, when in dawn we will again walk forward, but this time with a sacred limp. I felt rushed and unfocused when I started to read this. But by the end, I was calm, and centered. Thank you for bringing out the meaning in a story I have heard many times, and making it alive for me today. Anna, This is stunning. I was engaged and swept along in the reading of like I would have been swept along in a fountain of living water…but then, that is what your sermon truly was. The writing is beautiful and what I felt was Midrash at its very best…the gap where the Spirit comes through. Thank you Anna.